Colin’s involvement in music started in his school years – he began playing the trombone at the age of 11 and hasn’t really stopped since. 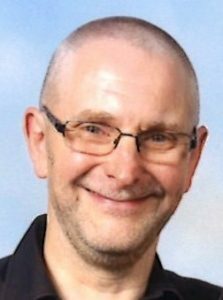 Over the years he’s attended various summer schools, workshops, and conducting courses and performed with orchestras, choirs, brass ensembles, brass bands, big bands, wind bands, jazz bands and musical societies as either a player/singer or conductor. He is currently the bass trombonist and MD of the La’al Big Band. In September 2000, Colin was awarded an Honours Degree in Brass Band Studies, majoring in performance and composition. Colin is very pleased to have been appointed as MD of W.M.V.C. and looks forward to working with the choir. Joan commenced playing piano at the tender age of seven, eventually achieving Grade 8 – Final – Royal School of Music. 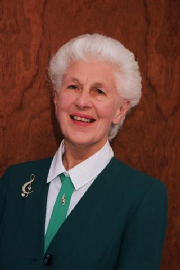 At eleven years old she was invited to play the organ at her local Presbyterian Church, the following year Joan was appointed organist at St John’s Mission Church, Cleator. Joan also played piano at school for singing lessons and assemblies. 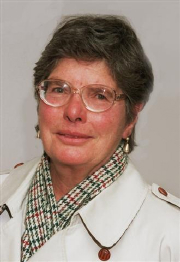 Throughout Joan’s extensive musical career she has played piano and organ for various concert parties, operatic societies, theatre groups, choral groups and church choirs throughout west Cumbria. Joan is always in great demand and currently plays the organ at St Leonards’ Church, Cleator and St John’s Church, Cleator Moor, as well as being accompanist for Whitehaven Male Voice Choir, a choir which Joan has been involved with for many years. Aileen grew up in Cheshire and trained as a teacher at Congleton, where she developed her musical skill. She has taught music in three local junior schools throughout her career. Aileen is accompanist for The West Cumberland Choral Society Junior Choir and former accompanist for the St Bees Ladies choir ‘Vivace’. Aileen was invited to undertake the role of assistant accompanist for Whitehaven Male Voice Choir in 2004 and the role of deputy musical director in October 2009. Aileen was promoted to the role of Musical Director in June 2010, following the resignation of Hugh Robinson. On June 14th 2012, Aileen handed over the baton and role of Musical Director to Peter Argyle. Aileen now deputises as accompanist and musical director when required.